Tranquil Creek Provincial Park is comprised of steep forested slopes and alpine meadows surrounding Paradise Lake, a pristine mountain lake at the head of Tranquil Creek. There are no trails in the park, however the open terrain allows for easy access from Paradise Lake into the alpine meadows. Recreational opportunities include hiking and rustic camping in this very remote, hard to reach wilderness area. Access to the park is by float plane only. Tranquil Creek Provincial Park is located in Clayoquot Sound on the west coast of Vancouver Island. 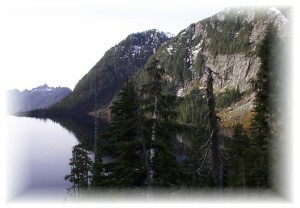 The park encompasses the headwaters of Tranquil Creek, which drains into the north side of Tofino Inlet, 8 km downstream. The park is accessible by float plane. Nearby communities include: Tofino, Ucluelet. History: This area was identified for protection in the Clayoquot Sound Land-Use Decision in 1995. Conservation: The park includes steep forested slopes and alpine meadows surrounding a pristine mountain lake at the head of Tranquil Creek. Approved Purpose Statement and Zoning Plan [PDF] for Tranquil Creek Provincial Park is available online in pdf format. There is no designated swimming area, however there are swimming opportunities in Paradise Lake. Please note that this is an alpine lake and the water is cold. There are no lifeguards on duty at provincial parks. There are no designated campsites at this park, however random wilderness camping is allowed. No facilities are provided and there is no fee. Tranquil Creek Park is accessible year-round; there is no winter backcountry camping fee at this time. Please practice “Leave No Trace” camping ethics.